When I sat down to review the North Texas year in beer, it didn't take me long to come up with a phrase to use as an overall theme. A year ago, I leaned on a movie reference to the Fast and the Furious films, which I think is still very much relevant today. As the number of local breweries grows, however, I find that these days my thought process is more along the lines of...the higher and higher it goes, where it'll stop, nobody knows. 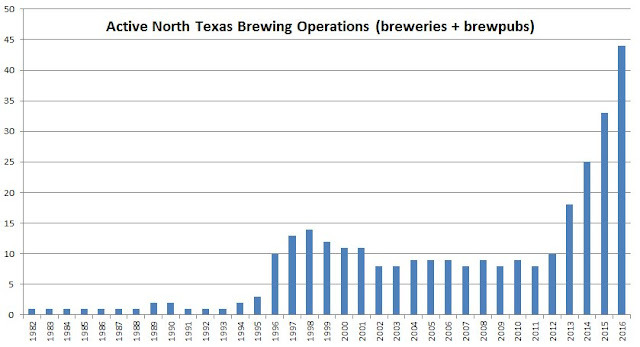 Indeed, as is shown below, we're talking record numbers in terms of how many brewing operations currently exist in the region. And there's not just more beer from here, there's more beer from everywhere, as more and more high quality national brands continue to filter into the state. Taken together, it's made for an environment unlike anything we've ever seen here locally. Not so long ago, the question used to be "do you know of any bars or restaurants that carry craft beer?," whereas now I sometimes wonder who in their right mind doesn't? The most amazing thing, though, is the fact that all of this has happened over the course of just five years. I can only imagine what the scene will look like five more years down the road. For now, though, we'll focus on all the things that went on in 2015. As in years past, I've broken things down into subject areas, and included a few of my favorite beers from the year to close things out. I don't know that there's any way to cover all that's happened over these last 12 months, but hopefully I've hit on some key points. Twelve months ago, 33 brewing operations called North Texas home, Now a year later, add 14 and subtract 3, and that number stands at 44. Take into account both the additions and subtractions and that translates to a net growth rate of just over 33% for 2015. Breweries: On Rotation, Nine Band, Tupps, Bitter Sisters, Four Bullets, Ivanhoe Ale Works, 3 Nations, Noble Rey, Oak Highlands, Woodcreek, Division. Brewpubs: Braindead, Barley & Board, Intrinsic Smokehouse & Brewery. Brewpubs: Kirin Court (ceased brewing operations, but restaurant is still open). Things don't look to be slowing down either, with Hemisphere, Hop Fusion, Legal Draft, Thirsty Bro, Wild Acre and Whistle Post currently under construction, and well over a half-dozen more (including some you probably haven't heard of yet) actively being developed. On top of that, the Colorado-based Backcountry Brewery has assumed control of FireWheel's facility in Rowlett, with plans to re-open the brewery in February. No fewer than three production breweries made the move to new digs in 2015, with Lakewood leading the way in April after the completion of a 14,000 square foot expansion project in Garland. Following that, Cedar Creek moved to a larger space just a few doors down from its original location in Seven Points, while Grapevine planted roots in its namesake city after operating for more than a year in Farmers Branch. On deck for 2016, look for Malai Kitchen to open a second location in Southlake, Cobra to undertake an equipment overhaul in Lewisville, and for Armadillo Ale Works to get back to doing what they do in Denton. Images have also been circulating showing a proposed taproom expansion being planned at Rahr & Sons, but details related to that have yet to be made available. As of today, 21 of the area's 30 production breweries package their products for retail sale (counting crowlers). According to my calculations, 16 breweries sell beer in cans, 8 offer all or a portion of their portfolio in bottles (note that some breweries produce a mix of bottles and cans), and two are equipped for crowlers. Bottles: Bearded Eel (some of which you may still be able to find), Braindead (limited release at the brewpub), Cobra, and Collective (limited release at the brewery). Cans as the brewery's first packaged product: 3 Nations, Audacity, Nine Band, Oak Highlands, Rabbit Hole, Texas Ale Project and Twin Peaks. Cans after initially producing only bottles: 903 Brewers, Community, Lakewood and Shannon Brewing. Up ahead in 2016, Backcountry intends to brew and can four of the company's beers locally, while Wild Acre has already received TABC approval for can label designs to appear on three of its debut products. Industry attempts to gain ground on a number of legal fronts (hosting of homebrew competitions, on-premise sales, direct shipments) were snuffed out completely during the 2015 legislative session. This occurred in large part due to efforts of the distributor lobby to maintain the status quo. In defending the position to oppose further changes in the laws, a spokesman implied that craft brewers are never satisfied in always wanting more, and that they should be happy with how things are, based on how much the industry is growing. One issue, that of on-premise sales, eventually became the focus of a federal lawsuit filed in September by Deep Ellum Brewing Co. (Grapevine signed on later as a co-plaintiff). In conjunction with this initiative, the brewery raised nearly $35,000 through a crowdfunding campaign dubbed Operation Craft Beer to Go, with the money to be used to help fund the effort. The goal, of course, being to secure the same rights enjoyed by wineries and distilleries, both of which are legally permitted to sell their products directly to the end consumer. Elsewhere, crowlers became a point of contention after the TABC determined that the use of the canning machine constituted a form of manufacturing, which isn't something retailers are authorized to do. Shops were ordered to remove the machines, leaving brewpubs as the only business entity allowed to employ them. Austin's Cuvee Coffee Bar defied the law as a catalyst to forcing a ruling on the matter, leading the TABC to confiscate the machine from its premises in December. A lawsuit was then filed, meaning the matter is now in the hands of the courts. Also pending is a 2014 lawsuit brought by Peticolas, Live Oak and Revolver that seeks to allow brewer's to accept compensation for distribution rights. In 2015, North Texas brewers continued a streak of gold medal wins dating back to 2012 at the Great American Beer Festival. In that time, adding the six medals awarded in 2015 to running totals from both GABF and the World Beer Cup combined, area brewers have been awarded a total of 19 medals (10 gold, 4 silver, 5 bronze) in just four years. Gold: Rahr & Sons Oktoberfest, Rahr & Sons The Regulator. Silver: 903 Brewers 2014 Sasquatch, Panther Island Allergeez, Rabbit Hole Rapture. Bronze: Twin Peaks Barrel-Aged Brown Ale. U.S. Beer Tasting Championship (winter, summer): Cobra, Grapevine, Lakewood, Peticolas, Rahr & Sons, Revolver. U.S. Open Beer Championship: Cobra, Community, Lakewood, Peticolas, Rahr & Sons, Shannon. 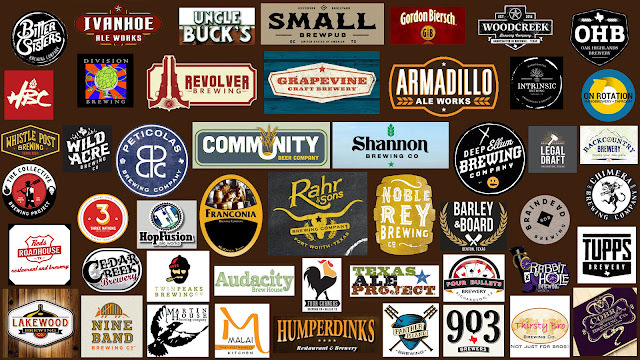 Los Angeles International Beer Competition: Community, Lakewood, Rahr & Sons. Best Little Brewfest in Texas (various breweries): Best in Show - Tupps Cotton Mill Gold. By my estimation (that is, according to my check-in history) I tried upwards of 150 different local beers in 2015. That number includes year-round and seasonal offerings, as well as one-offs, but the total still far exceeded my expectations. For those who say there isn't much variety in local beer, my first thought is these people aren't making enough of an effort to see what's out there. Regarding out-of-state brands that are new to Texas, there was once again an influx of well-known names that began distributing here for the first time. A short list includes Alpine (by way of Green Flash), Bayou Tech, Cascade, Evil Twin, Funkwerks, New Holland, Ninkasi, Stillwater Artisan and Urban Family. No doubt more are on the way, as evidenced by the pending arrival of Alesmith in a few short weeks. As for a few favorites, I'll go my usual route and share them by way of mock categories that apply to each beer presented. Yes, there's a bit of a local slant, but remember that this is a local blog that focuses primarily on promoting local beers. Anyway, the standard disclaimers apply...beers have to be new to Texas in 2015 (though, there is one necessary exception), or at least new to me...and most importantly, tastes differ, so it's understood that not everyone will share the same opinion with respect to my choices. Ask me to make a list of under-represented styles, not just locally but in general as well, and I'd probably put dunkelweizen near the top of the list. Thankfully, Oak Highlands has filled that gap with DFDub, a well-executed, stylistic dunkelweizen that's now available year-round in cans. Regardless of whether you call Founders Redankulous an imperial red, an IPA or both like it says on the bottle label, this bright and bitter beer from one of my favorite out-of-state breweries could not have had a more appropriate name. As far as the judges at GABF are concerned, it's an imperial red, since the beer won gold in that category in 2015. Also notable: Boulevard The Calling, Franconia Ice Bock DIPA, Community Oaked Mosaic IPA. Given the continued proliferation of barrel-aged beers, the best way for me to judge what I consider to be a favorite in this category comes down to finding a beer that I keep coming back to, even when presented with other arguably equivalent options. This year, that beer is Community Barrel Aged Legion Batch 2. The fifth incarnation of BA Legion is out now, but for me batch 2 had far and away the best overall balance between bourbon and beer. Also notable: 903 Brewers Balcones Barrel Aged Sasquatch (whiskey), 2015 Southern Star Black Crack (whiskey), Prairie Okie (whiskey), Ballast Point Rum Barrel Aged Victory at Sea, Shannon Chocolate Rum Stout, Nebraska Melange a Trois (chardonnay), Karbach Trigave (tequila). The idea for this category came about after seeing North Texas brewers win medals in the Aged Beer category at GABF for two years running. My choice? A beer from what might just be the most improved brewery in North Texas over the last couple of years. The 2014 edition of Kitchen Sink from Cobra was a revelation when I had it fresh last year, and while it wasn't as intense after aging another 12 months, it was still a damn good beer when poured at the brewery's third anniversary party a few weeks back. Unfortunately, I helped empty the last remaining keg...oops! Smoked beers are something I'd like to see a lot more of, especially here in Texas given the state's love affair with BBQ. Clown Shoes A Fistful of Unidragon is just such a beer, made better by the fact that it incorporates mesquite-smoked malt grown in Texas. Oh, and it's aged in bourbon barrels too, in case you're into that sort of thing. Also notable: Clown Shoes The Good, The Bad & The Unidragon (Fistful is the barrel-aged version of this beer), Clown Shoes Crasher in the Rye (Texas oak-smoked malt). While Destihl's Zure Dubbele Stout probably could've qualified for a couple of the categories above, given its sour status I feel like it fits best as a favorite here. For whatever reason, I didn't take down any tasting notes, but I do remember it being dark, complex, funky and good. Also notable: Braindead 10th Anniversary Brett IPA, Collective Blueberry Petite Golden Sour, Lakewood Wild Manimal. Deep Ellum's Barrel Aged Four Swords is another beer that's gone through a couple of iterations, but for my money the original batch released in January was hard to beat. Rich, layered caramel fronted a beer that drank more like a vintage port. In some ways it reminded me of Samael's Oak-aged Ale from Avery, though, this beer had bits of fruit complexity that gave it that little something extra. Love the list of beers. I believe 2016 has a lot in store for beer in Texas. I think there is going to be more interest from big beer companies. Big beer can offer a lot especially in the way of national distribution.